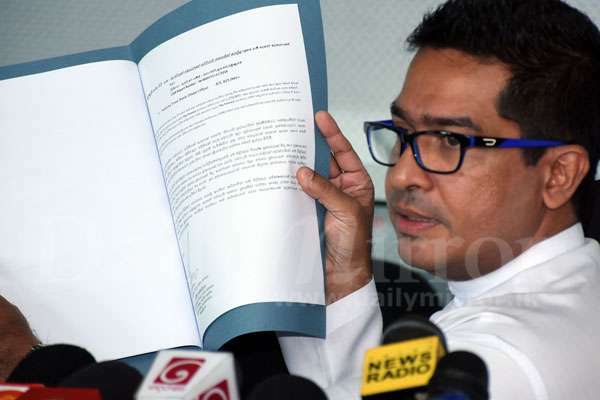 Denying the bribery allegation over the high-speed railway project, State Minister of International Trade Sujeewa Senasinghe said that his mother had asked him to leave politics due to continual issues coming towards him. He said that he was forced into politics; however, he had scored well and secured more votes gradually. The State Minister said that though it was difficult to do politics he couldn’t give up and let down his voters. He said that it was unfortunate that anyone could throw allegations by holding a press conference and he was distressed by the issue as he was innocent. “To approve the project or whatever they have said, that the State Minister had asked for a bribe, and that is thuggery. “Most investors come and they want to take a picture with me. I’m a person who is very accessible. Anyone can meet me. I’m not scared. But now I’m scared. “If I meet you what you would tell me next time? Why should I ask a bribe if I’m not involved with the BOI? he said. 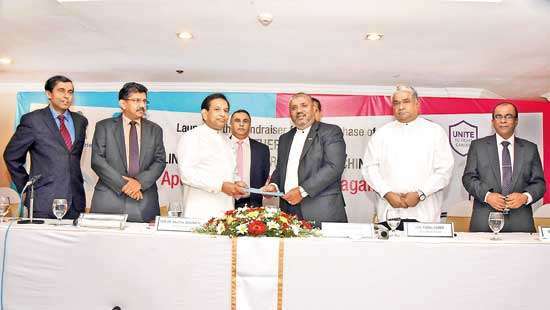 Ceylon High-Speed Railway (CHSR) Limited had submitted an application to 488 million Euro mega integrated high-speed train manufacturing plant project in October 2016 to the Board of Investment (BOI) approval. However a year later, the project was sent to be evaluated by the Cabinet appointed Single Window Investment Appraisal Committee (SWIAC). 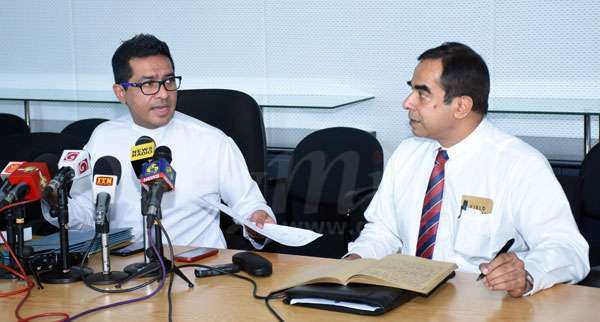 The director board recently in a press briefing allegedly charged that Development Strategies and International Trade Malik Samarawickrama and State Minister of International Trade Sujeewa Senasinghe kept delaying the project seeking a ten percent of the investment as a bribe. MP Senasinghe said the project was deferred as the investor had failed to submit the required business proposal requested by the SWIAC. He claimed that such a company was non-existent and there was no Italian investor, although the Board of Directors claimed so. He said that the board of Directors of the said company had been given several opportunities to provide necessary documents but they failed to do so. He added they still could provide the requested details. “When asked the director, where the money was coming from he responded that it was a secret. What is the secret about the project proposal and the financial sources? He said that Italians are involved in the project, which is another lie. There are charges against the whole family in this project. And they are making charges against us. Anybody can bring a proposal to the BOI. But there are many regulations they should fulfil to seek approval,” he added. 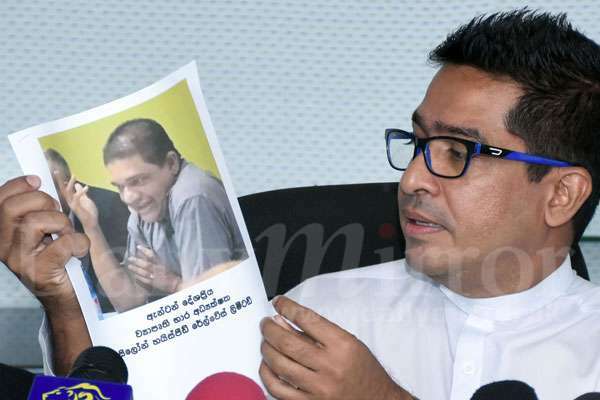 MP Senasinghe said he had written to the President, the Prime Minister, the IGP, the FCID and the CID seeking justice. He said that the law enforcement authorities should take swift action and investigate into the matter. “I don’t know whether to laugh or to cry. It is very unfortunate we have to face such situations. I obtained the background and the CRIB Reports of two Directors of the company who are residents of Ja-Ela. “Action must be taken against them as there is a huge credit against their names. “In my complaint letters, I have urged them to take action and to safeguard us as politicians. We are young politicians doing politics with principles and dignity. “The media also has a duty to report the truth. Not just publish both sides and say that they are neutral. “Do investigative journalism, go through the documentation, ask questions from these people and then if you are satisfied then publish it. “You don’t have to be partial towards any side. I think swift measures should be taken. Through Good Governance, we have brought a lot of freedom to the media. That freedom should not be misused. And I would urge President also to have a responsibility. The Prime Minister also has a responsibility in safeguarding us not only those who are close to them. 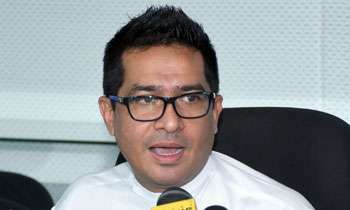 They have a responsibility to safeguard clean and young politicians,” MP Senasinghe said. She must also be ashamed of you. What is wrong being a mummy’s boy. In America I have seen television personalities finishing their programs by saying at the end “I love you mum”. Mother knows best and realises that her sonna boy is upto mischief! what does his wife say!!!? She should be clever enough to see that he had earned enough for several generations to come. Please do. Mom knows best. Not simply because she has to protect you, she do care about her health. Sneezing all the day is not good for her lungs. You have betrayed our trust. Just like so many others have done before you. Please go ahead. Your mother is correct. So what you say is your mother is wiser than you? Well she is more matured. Generally in investment projects of this magnitude it is necessary to provide details of the financier,, including audited accounts and even bank comfort letters, for appraisal. The directors of the company in their media shows never indicated that they had provided this information. Judging by the requirement of 4000 acres of land and a fancy shopping list including 4 helicopters published in a previous DM report, the minister may be justified in assuming this project fishy . Not only your mom even we too don’t want seeing you in active politics! At least it’ll help reducing bribing culture among politicians up to some extend. Didnt mom ask you to return the money you received from Perpetual treasury ? Don't worry the next election the people will make your mom's wish come true..
mom knows that you are with wrong people. 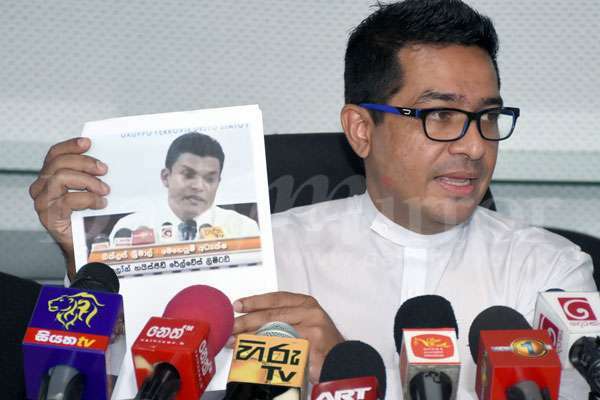 Its your leadership in the UNP that is at fault . A young , energetic and honest leader in the UNP will definitely change the political climate for sure . But instead you are following your fathers footsteps. We all know how he bacame rich. The State Minister said that though it was difficult to do politics he couldn’t give up and let down his voters ... Sorry you are not letting anyone down by leaving the politics, in fact you are making a large voter base happier by leaving the politics ... the reason for unwillingness to leave is simple its the greed and hunger for fame. Now don't be naughty. Please listen to mommy!!! Thank you MOM. Best suggestion you made to your son for the sake of the country. We are very proud of your mother for bèen brave enough to tell you the wish of majority of this nation. Please please quit!!!! What did your mother say when you sold your government permit?.Didn't you say without the permit, you can't travel and get work done?. And then since all. Of you deserved the land cruiser, you bought it and then sold it. So how are you getting your work done now?. sri lanka is not for genuing educated people like you. future of this country is for uneducated rogues. His level of educarion we saw during the bond scam. 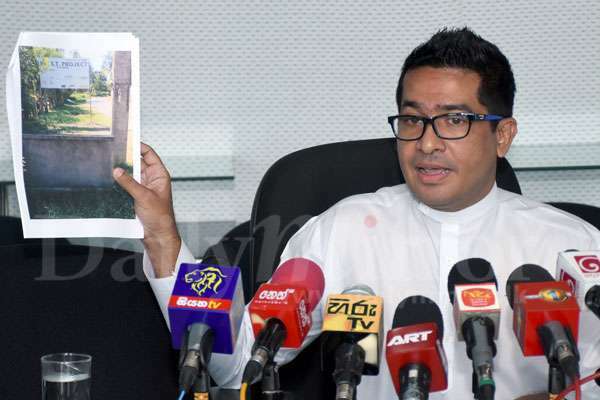 To prove his education, he even written a book..
Sri Lanka is not for poor thinkers like you and this mama boy. Probably Mom thinks that he has earned enough. Never mind you leave or stay in politics but you may have to go behind bars for the Central Bank issue and now this mass bribery matter. When taking bribes didn't mom tell you to quit politics. After you got caught mom now says; Putha leave this damn politics. Why??? Not making enough money!!?? Make your Mama Proud, steal a little more before quitting! Majority wants you to babysit at home. "The State Minister said that though it was difficult to do politics he couldn’t give up and let down his voters. "What a contradiction. Politicians are not chosen by people they were forced on people by political parties; Money talks. Hey politics is dirty in most part of the world!!?? It stinks to the core in SL !?? Yeah!! Get lost we dont need you . Now that you have spoken about legal action you should immediately file action to prove you are a honest person. You have to save your name otherwise this will be repeated over and over again every time some one wants to attack you. You should ask for larges sums of money for defamation. Clever lawyers have lucrative practices. Many who failed (except a few) at the Bar joined politics for the perks and benefits and commissions. Mum's health must be a priority. So leave politics ASAP. Don't plead to MS, RW, IGP, or FCID. Defend your self and get out if you are clean. Not only your mom, but the entire country wants you to leave politics for good and spend your time behind bars, you dirty rogue who will do anything for money. 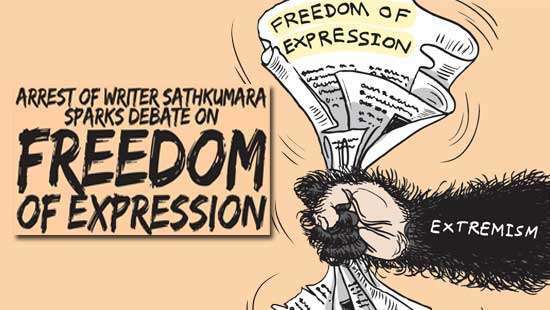 It would have been better the whole politicians take long term leave on request of Mother Sri Lanka and handover the governance to the able intellectuals to collectively manage the country's internal and external affairs. Your mum wants you to leave politics is because the political party you represent the UNP has NO leader I mean a real leader . Mom wants you to quit because people always curse her for your actions. Not only your mum, my mum wants you to quit too. Trying writing another book just like the other one - this time you can entitle it "Mum's The Word" ! I think you should quit immediately. SS is not at fault here and ask the haters to look at the facts. The accusers look a bunch of broke crooks with no class. A railway company setting up in Sri Lanka is a joke. 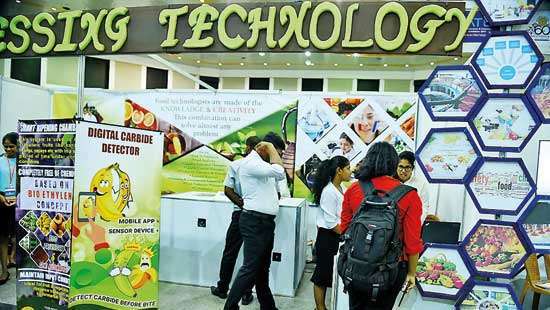 Where is the market, who are the investors, what’s the technology, what’s track record, corporate profile. Sir, Please read the comments that you have received. It will make easy for you to make a decision. Please Note that as voters we didn't expect you to build a Rome in one day. But as a young politician we expected you to be Honest to the people who voted for you. You have just let us down. We want you to know that. If you haven't, prove otherwise. Thank you. Our country have only dirty politicians with clean suit. Everyone is a saint except the saint!!!!! In this short period of time you have earned a lot.. dont worry about voters.. you better go.. for the sake of voters.. Didn't your mother say to you that don't steal from others too?? Shik ashamed... of your behavior Mr Minister.. Your mom wants you to leave politics because she loves you. We want you to leave politics because we love this country. Your behaviour reveals a lot about you which you have been desperately trying to hide. Mom would have noticed every time she sneezes that people must be remembering her for son's dirty work. Not only politics ..please go from this country for good you theif .. This term may be your last term in parliament.You have earned enough from bond scam , now train project. These are only few come into the light. Please quit as early as possible. This it self service to the country. Shame!!! You have brought shame to your school, which is a leading institution in the Central Province known to maintain discipline. You have let down your school and colleagues like us. Mommy Mommy this one stole my Banana....!! The reason is ,the people always remind her because of the acts of her son. Aney my dear son, why don't you obey the loving mother! You can get back to your profession and earn honestly out of your expertise!! Hay,senasinha,all wanted what your mom wants,ask you team of friends, who collected Aloysius's 3million bribe on behalf you, to write few comments supporting you.